Here in this post, I am going to discuss and review a nice PHP script that is a Facebook and YouTube video downloader. With the name, you can think what this script can do and what will be the functionality of this script. But still, I am going to discuss in details about this script. Facebook Youtube Video Downloader – FB-YT Grabber is a PHP script available which can download any Facebook and YouTube videos. All it needs is just to provide the URL of the video page from Facebook or YouTube that one wish to download. After submitting the video page link there are no needs to refresh the page. The result will appear on the same page and you can download from that page. Now I am going to discuss the features of this script in details. 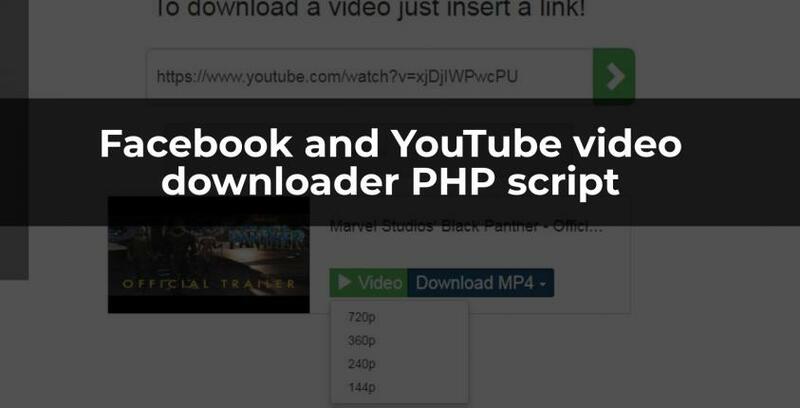 This PHP script can download both YouTube and Facebook videos. It just needs to copy and paste the video URL from Facebook or YouTube in the field of this script and after submitting it the download link will be available. No page refresh required after submit the video link. It works on AJAX to retrieve the download link and also so fast. This script support 4 types of ad and you can also monetize your script from any kind of publisher ad network. Image types of ads are responsive. This script is completely mobile friendly. There is support for Google Analytics added so that you can see the traffic stats of your site. Encrypted videos can be download easily as there is a signature decrypt function added in this script. This script has the capability to handle any kind of error. It shows the perfect error message if a user provides invalid URL or any other types of URL that is not a YouTube or Facebook video page URL. After submitting the video URL, there will multiple links available which will allow downloading a video in multiple qualities. Play the video before downloading it is a nice feature of this PHP source code. No database required to run this script. Easy to install. Just upload to your server and unzip it. After that, you can run the script immediately. To run this PHP script on a server, the server should have PHP 5.3 or higher version of PHP. Nowadays, almost all the web hosting providers provide PHP version that is higher than PHP 5.3. The good thing about this PHP source code is that there is no need for any kind of database which makes this script simple and easy to use. How to get the source code of this YouTube and Facebook video downloader script? I have already added the link where you can download the complete source code and the demo live site of this script. Again here is the link where you can download the source code of this script. From the link, you can find all the features and the live demo of that script.